Japan has long been an anomaly: an economic powerhouse within a geostrategic pygmy. But China’s muscular ascent combined with the unpredictability of a Trump-led U.S. is causing Tokyo to rethink its role in Asia. From proposing new security dialogues, to taking the lead in developing multilateral trade agreements, it is beginning to pick up some of the slack left by the U.S.’s “America First”-influenced withdrawal from leadership in Asia. For President Xi Jinping’s new China, the days of “hiding capabilities and biding time” of the Deng era are finally over — it’s time to become “a global leader in terms of composite national strength and international influence”. Chinese revisionist claims in the land and oceanic space have been a major source of concern. Beijing’s deployment of naval assets to enforce its claims across the South China Sea, construction of artificial islandsin the region, and the rejection of a UN tribunal judgment on a complaint filed by the Philippines, last year have only strengthened this feeling. China has also been increasing its naval presence, including dispatching its nuclear submarineson patrol, in the Indian Ocean. Along with military assertion, Beijinghas also been stepping up its political and economic footprint in the region through its BRI (Belt and Road Initiative). China’s superpower ambitions are bound to have a system-shaping impact on the Asian region. There will be China-led alliances, Chinese client states and the establishment of Chinese spheres of influence. Under the post-war constitution, Japan is not allowed to have offensive military forces. Its Article 9 declares “the Japanese people forever renounce war as a sovereign right of the nation and the threat or use of force as means of settling international disputes. Japan has the Jieitai or Japan Self-Defense Forces. The SDF is a full-fledged military, with army, navy, and air force branches. Technically the SDF is not allowed to conduct offensive operations or to deploy outside Japan, but it is still a very potent military force. According to Article 9 of the Japanese Constitution war is illegal. However, the Emperor of Japan is allowed to declare peace. Japan is in a potentially explosive neighbourhood, and it no longer believes that a whole scale reliance on the U.S. for a defence umbrella is sufficient to secure its best interests. Japan is in an era when Japan has to exert itself diplomatically by drawing a big strategic picture. Military normalisation is one prong of Japan’s new foreign policy, but even if a controversial revision of Japan’s pacifist Constitution, as proposed by newly re-elected Prime Minister Shinzo Abe goes through, the archipelago’s armed forces will remain under strong, self-imposed constraints. The constitutional revision would merely recognise the legality of Japan’s long extant Self-Defense Forces (SDF). Offensive weapons and pre-emptive strikes would remain outlawed. Remilitarising alone will not provide Japan with an effective solution to its diplomatic dilemmas. Tokyo needs to use its strengths, its capital, its technological know-how and its democratic credentials to win friends and influence countries across the region and beyond. It needs to beat infrastructure sugar daddy China at its own game. A large part of China’s rise has to do with its indispensability to global trade. But Japan is a trading heavyweight too, and is attempting to stake leadership on the regional platform with the Trans-Pacific Partnership (TPP). With the U.S.’s departure from trade negotiations, Japan has become the principal driving force keeping the deal alive. At November’s Asia-Pacific Economic Cooperation summit in Vietnam, Japan got the 11 countries still involved to agree on the “core elements” of a deal. It wants to lead rule-making on trade in the Asia Pacific, rather than let China set the agenda with alternatives to TPP such as the Beijing-backed Regional Comprehensive Economic Partnership (RCEP). Japan is also stepping up aid and investment in Southeast Asia. A train line near Manila, a seaport in Cambodia, and assistance in the reconstruction of Marawi City in the Philippines are some examples. As the top source of development aid to Vietnam, it has helped construct a new airport terminal in Hanoi as well as the first subway line in Ho Chi Minh City. Japan recently committed 1 trillion yen ($8.7 billion) to the Philippines over the next five years, with a continued focus on infrastructure development. Japanese investment in major Southeast Asian countries is estimated to have averaged $20 billion per year, from 2011 to 2016, more than double the average annual flows between 2006 and 2010. Japan and India have announced an Asia-Africa Growth Corridor, aimed at creating sea corridors linking the countries of the Indo-Pacific to Africa. In addition, Japan is cooperating with India in third country infrastructure projects such as Iran’s Chabahar Port, Sri Lanka’s Trincomalee port, and the possible joint development of the Dawei port along the Thai-Myanmar border. Japan has bagged the $17 billion contract to build India’s first high speed railway line, linking Mumbai and Ahmedabad. Tokyo is also investing in development projects in the Northeast and the Andaman and Nicobar islands. And Japan’s Diet gave the go ahead to a Japan-India civil nuclear energy deal earlier this year. The possibility of purchasing Japanese submarines and search-and-rescue planes to help the Indian Navy is being discussed. A free and open Indo-Pacific, a phrasing that places India as a major actor in the Pacific, is an idea being proselytised by Japan in conjunction with the U.S. This is a response to concerns over the expansion of the Chinese navy and Beijing’s territorial claims in the South China Sea, waters through which a huge majority of Japanese energy supplies transit. 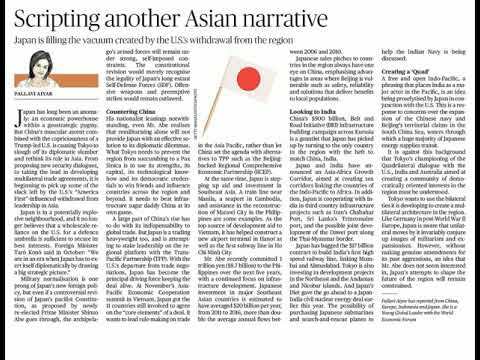 It is against this background that Tokyo’s championing of the Quadrilateral dialogue with the U.S., India and Australia aimed at creating a community of democratically oriented interests in the region must be understood. However, The Quad is yet to decide what its real aim is: maritime security, connectivity, countering China’s moves in the Indo-Pacific and on the Belt and Road Initiative (BRI), or a combination of all three. Tokyo wants to use the bilateral ties it is developing to create a multilateral architecture in the region. Like Germany in post-World War II Europe, Japan is aware that unilateral moves by it invariably conjure up images of militarism and expansionism. However, without making genuine amendments for its past aggressions, an idea that Mr. Abe does not seem interested in, Japan’s attempts to shape the future of the region will remain constrained.